June | 2015 | Lamb on a bike! Conversation at my office is wide-ranging. Of course, we talk about education systems and funding gaps and why the printer has a mind of its own and goes through phases of only printing on A3. But every day there’s usually a more off-beat conversation. Yesterday we discussed, at relative length, picnic blankets. There have been days involving discussions about dogs/dog cafés/whippet puppies. Today we started talking about giving blood. I’ve given blood since I was 18, with a few enforced gaps due to overseas travel and a few gaps due to my own laziness. I’ve got certificates and pin badges from the National Blood Service for reaching particular milestones. I feel like it’s an important thing to do, that it’s an easy but life-saving act and I often wonder if people who don’t give would be happy to receive. No one else in my team appears to have given blood, ever. When I was 19 I was quite thin and apparently this makes your veins small too. The nurse used a too-big needle and punched a hole right through my vein. Blood pooled in my elbow and I wasn’t allowed to use my arm for a week. One wintry Sunday morning, I was giving blood in a church hall. The heating was on but it hadn’t made much difference, so I was huddled under my coat with just my arm sticking out. I’d been gazing at the ceiling, but looked over at my blood bag to see the nurse holding it, warming her hands on it. It turns out that there’s a time window in which you have to get your blood out, and I once came near to the cut-off. The blood can’t be used if the donation isn’t complete so a gaggle of nurses surrounded me shouting “pump it!” at me. Several of my friends have had to have blood transfusions and it’s saved their lives. It takes an hour, doesn’t hurt and you get snacks. If you can and you don’t already, you should. I’ve previously done 2 pool-based sprint triathlons and decided to venture into middle distance. My brother recommended the Cotswold113, as he’d previously done the Cotswold Classic, and we entered together. Our mum kindly drove us to the Cotswolds on Friday afternoon and we spent a rainy day hanging out eating desserts, driving about in a white van and getting ready for race day. It was my second time swimming in open water (and the first time I’d been freaked out by a fish) and I was anxious. My brother (Chris) and I were in the 4th wave, which meant a 6:30am start – we’d been there since 4am. Just before the start I spotted an internet friend, Ewan, and he gave me a few words of encouragement. Chris and I had a last minute hug and got in the water. We skulled about acclimatising and I could see mum on the edge of the water so goofed about for photos. I was nervous as hell. The countdown went and we swam off. I felt okay initially and then started panicking. I felt myself hyperventilating and making little progress. Two women in front stopped and a canoe arrived to check on them. I became paranoid that the canoeists were laughing at me, and this gave me the impetus to sort myself out and I settled into a steady stroke, not fast but not exerting myself. I’d never swum 1.9km before so my plan was centred on not drowning. 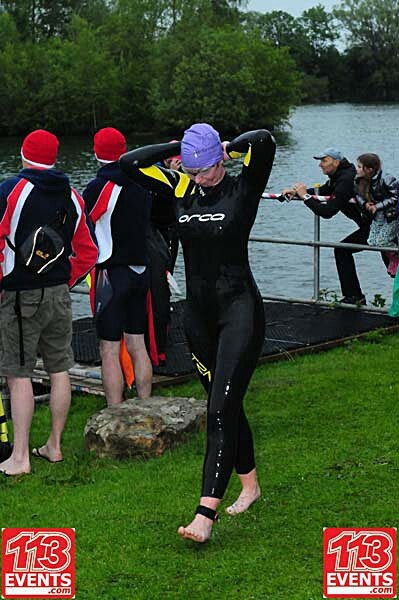 The swim course was one lap around the lake with a diversion into the middle to make up the distance. I’d miscounted how many buoys there were before this diversion, convincing myself for a while that we didn’t have to do it. I was overtaken by fast swimmers from the wave behind and decided to push on and see whether I could speed up. Turns out I could keep up with the front-of-middle swimmers and for a second in the last 500 metres I felt almost fishlike. I swam to the jetty where volunteers were pulling people out. Using my arms to drag myself up as high as I could, I looked up to see Loudmouth Dave, one of the most vocal marshals. I put my hand up and he shouted words of encouragement while hauling me out of the water. 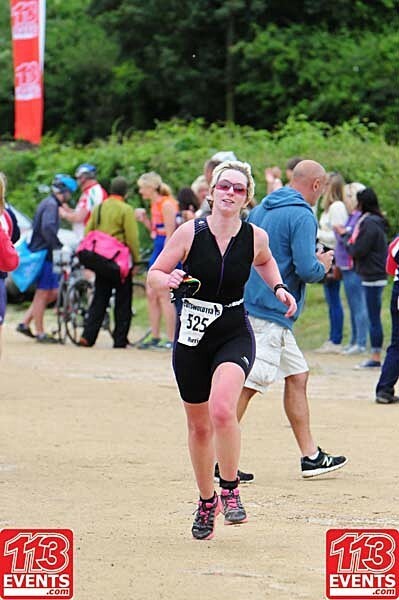 This is the best thing about triathlon: a strong man pulling you out of a lake. I’d forgotten to let water into my wetsuit before getting out but didn’t struggle too much extricating myself. I walked briskly to my bike, concentrating hard on remembering to take off my goggles. I wrestled with a jacket and dropped my helmet putting it on. Socks on, shoes on, mitts on and I trotted through transition to the bike mount line, letting out a substantial burp on the way. My legs felt fine as I got on the bike, a little tired but I figured they’d warm up. The course was two laps, an out and back with a large loop as the turnaround halfway through each lap, on reasonably quiet roads including some pretty lanes. It was narrow in places, making it difficult to overtake – especially when I came across a man riding in the middle of the road in the other direction, who I may or may not have called a dickhead. I found it hard to keep my speed up and there didn’t seem to be a reason for it. It wasn’t windy and the course was predominantly flat. I was riding a bike that I normally ride a lot faster when laden with a heavy saddle bag. It was disheartening. On the loop there was a hill – “the hill” – just after Hanningford. It wasn’t too bad but after descending there were another two rollers. The first was fine, but on the second I was overtaken in a pincer movement by two men, who came to a standstill directly in front of me. I screamed at them to move but I was boxed in. They must have known they didn’t have the momentum to go up the hill so why pass me only to stop, blocking my path? I can only assume they are London bus drivers. From here I rode back to the start line. My mum was marshalling here and so it was good to see her. 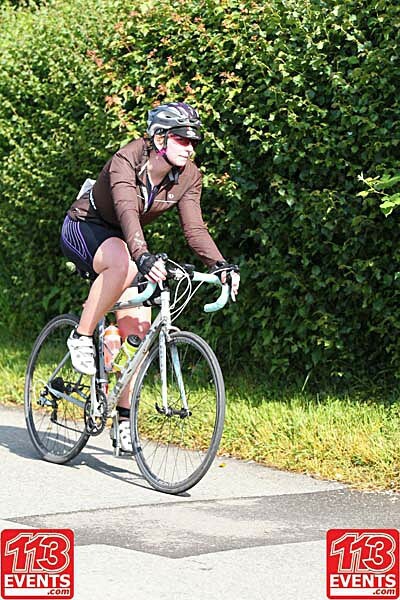 I don’t think she spotted the chap who rode into my rear wheel as I slowed to pull back out onto the main road and begrudgingly began my second lap. By this point I’d eaten 2 bites of a PowerBar Ride bar (a chocolate and peanut concoction) but my hands were numb so I couldn’t eat anything else as I couldn’t pick it up. In the end I stopped to shake some life back into my hands and ate the rest of the bar, which annoyingly let lots of people past me. One part of the course had subsidence due to a badger sett, and a marshal was positioned here to warn cyclists/scare away badgers. I didn’t see any badgers here BUT later on I saw a dead badger by the side of the road – hopefully there hadn’t been a cyclist-badger incident. My mum saw one rider come down and not get back up, so I hope he was alright. My brother also spoke to a chap who’d ridden into a ditch and cut his face. My second lap was slow and rubbish. I struggled for power, motivation, speed and confidence. Nothing hurt but nothing felt great. I’d been hoping for 3 hours on the bike and felt very disappointed when this slipped by, but couldn’t do a lot about it. I ran to where I’d racked, where the label clearly had my name and number… and could only see other people’s stuff. There were towels and clothes strewn on the floor but none of my belongings. Hmm, I thought, I must have been moved elsewhere. I set off to have a look around before realising this was absurd and looked under the pile of stuff – there were my shoes! I had to rearrange all the bikes to get mine in and root around to find my shoes. I planned to walk the first 100m of each kilometre and run the rest. As I set off, a woman on her 2nd lap passed me and commented “it feels like you’re running in bike shoes at first, doesn’t it? !” – I had to check I wasn’t running in my bike shoes. I ducked into a field as I needed the loo, and had cramp in my foot that wouldn’t go away until I took my shoe off to rub my toes. There was a concentration of cheerers at 3km, where the run crossed the bike course, and I saw mum again (as well as Ewan, well on the way to the finish). 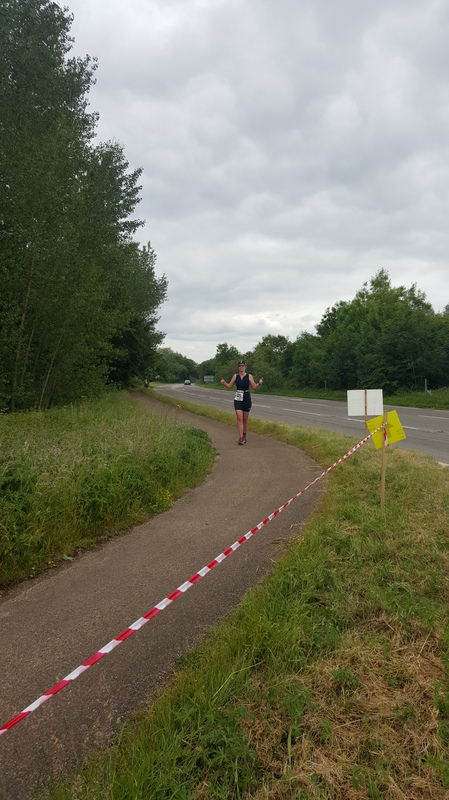 At 4km there was an aid station with an array of goodies – I had water, a jaffa cake and a handful of jelly beans, which melted and left brightly coloured sticky streaks on my palm. I wasn’t feeling great and passing through the finish area to start my second lap (of three!) was depressing. There were people finishing and others with medals around necks. I felt worse and worse and at 9km I spotted some public toilets so popped in. I wished I hadn’t as I saw my reflection in the mirror – I was deathly white. I stayed there for a few minutes but knew I had to carry on. Soon afterwards I saw mum and she walked alongside me for a minute, telling me I was doing well. I felt terrible. I asked how Chris was doing and she said she didn’t know. I saw a man on the ground being treated by paramedics and the temptation to climb into their car was enormous. I passed the aid station and had 2 small cups of coke and more jelly beans. A man grabbed some ginger cake, which I thought was an interesting thing to eat while running. Finally I felt a little better and when I passed through the finish area again I gave Chris a wave. By this point I’d picked up a new friend, a Welsh girl who was also having a tough time. We stuck together for a while before I headed off, still trying to adhere to my 100m-900m walk-run ratio (although sneaking in extra walks). The lakeside path was quiet as there weren’t many competitors left and I was embarrassed to still be trudging around. At 17km I saw mum again, this time with Chris. I felt immeasurably better than the last lap and posed for photos. I asked Chris how he’d done and he said he’d tell me later. I wanted to know but there was no point arguing. I set my sights on the aid station: what would I have this time? The answer was, yet again, jelly beans. Meanwhile, another story had been unfolding. My brother, the Iron Lamb, had had a reasonable swim and set off on the bike only to hit a pothole about 6km in and pinch flat his front wheel. His race was over in less than an hour. As he waited for race support to pick him up, he hid so that I didn’t see him – he knew I’d be behind him on the bike and that if I’d seen him I would have stopped to try to help. My mum and Chris kept it a secret until I’d finished, as I’d looked so grim halfway through the run and they knew I already felt bad at keeping them waiting. I am impressed at how philosophical my brother has been about it. I’ve held off writing this as I was waiting for my feelings to settle down. At first I was happy to have finished (especially the swim!). But this turned into guilt: I wished I’d had the mechanical and not Chris, and that I’d been able to put on a better performance for my mum, who’d given up her weekend. And remorse: for not training enough, for not prioritising running over the last few months. And shame: for being so slow – I didn’t come last but I was 152nd out of 171 women. I’m still waiting for self-acceptance (I’m always waiting for this). I’ve learnt a lot: I need to eat more in races; I need to dedicate more time to running and run better when I do run; I need to keep calm swimming and I need more confidence on the bike. So now, another race?